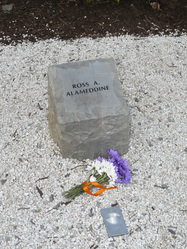 Flowers placed at an entrance to Norris Hall on 4/16/08. 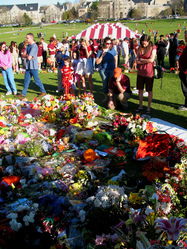 Flowers and visitors at a memorial on the Drillfield on Hokie Hope Day, 4/21/07. 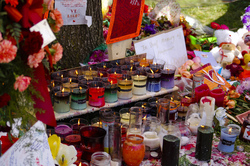 Candles and flowers at a memorial on Hokie Hope Day, 4/21/07. (April 18, 2007) Flowers in front of Norris Hall. located on the drillfield directly in front of Burruss Hall and not far from Norris Hall. Taken April 21, 2007. 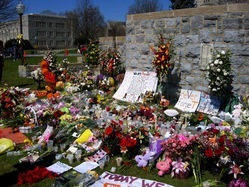 Virginia Tech memorial on the Drill Field. 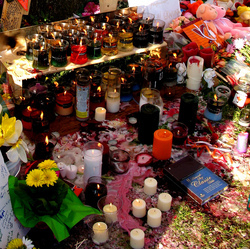 Photo taken April 21, 2007 by Ross Catrow. Licensed under Creative Commons Attribution-Share Alike 2.0 Generic. 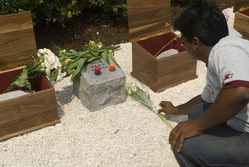 After the memorial dedication ceremony on August 19, 2007, an unidentified man lays flowers next to Minal Panchal&#39;s Hokie Stone. 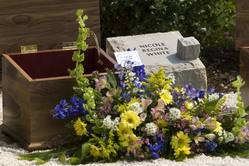 Flowers in front of Nicole White&#39;s new Hokie Stone. 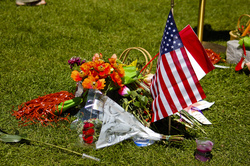 Photo taken August 19, 2007, the day of the memorial dedication ceremony. 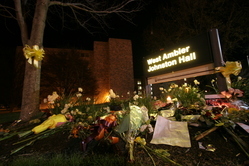 Flowers and mementos at West Ambler Johnston Hall. 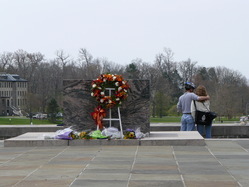 Photo taken April 22. 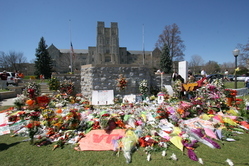 View of the expanding memorial in front of Burruss Hall. Photo taken April 21.